Starting from the center, working clockwise (if manuscript pages are turned right to left):The eight points of the compass: N, NE, E, SE, S, SW, W, NW and their corresponding names. Fourth/outermost ring: not sure of this yet, could be names for Greek/Roman/Persian gods or goddesses that should correspond the astrological houses they are directly above. I will consider this further. VViews recently posted a link to an interesting XV Century English almanac (Morgan Library MS M.941). 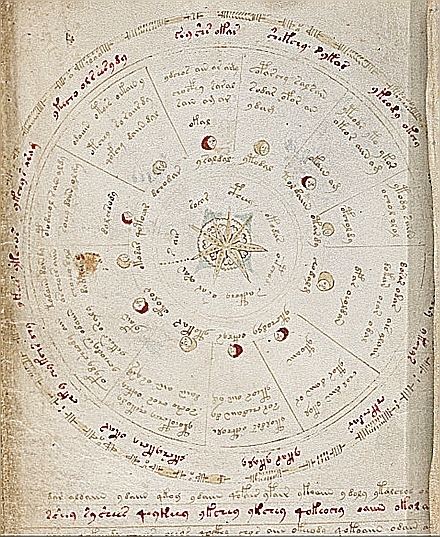 The ms contains a diagram of the twelve months; the center is occupied by a large seven pointed star labeled with the names of planets in the order of the days of the week. The diagram is similar to some of the Voynich cosmological illustrations. I attempted a parallel with f67r2: the twelve crescents are suggestive of the twelve months, but in this case the star is eight-pointed. I arbitrarily interpret the last two labels inside the star as a single label, trying to match the seven labels to Sanskrit and Persian planet names (starting from the dotted line that apparently marks the start of the sequence). The phonetic interpretation of the labels is based on Stephen and Derek’s theory. I followed the same order as in the English diagram (Sol, Luna, Mars, Mercurius, Jupiter, Venus, Saturnus). Clearly, this is all very speculative. Some of the matches are poor. Most of the above Sanskrit names were not associated to the days of week (in these languages, the planetary gods had multiple names). Also, the interpretation of the last label (or couple of labels?) is particularly dubious because the connection between Varuna and Saturn is not obvious. Still, the the association between the names of the planetary gods and the days of the week is a concept common to many cultures: it is a strongly constrained set of names that is likely to appear in a XV Century cosmological manuscript. I could not format a table in the text message. I’ll try with an image instead. you can select an given year, any given millennia as well as separate documents for the lunar and planetary cycles. Professor, if the URL does not work for you let me know. 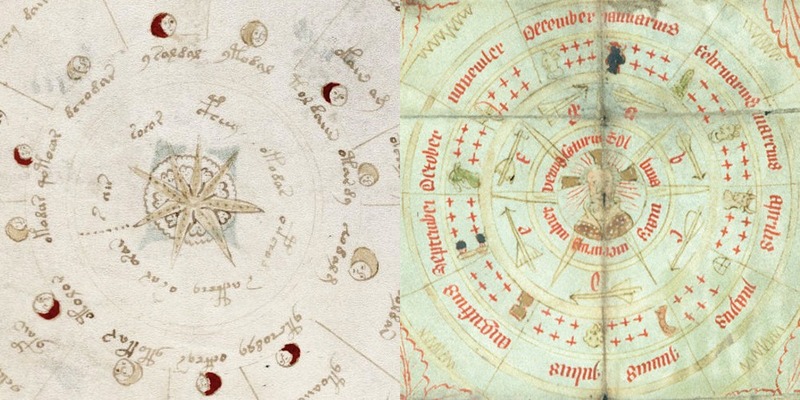 It is not a coincidence that next to nothing in the Voynich manuscript definitively points to any classical, asian, semitic or otherwise familiar cultural construct. The reason it will continually set one adrift down these tangents is because it is outside these realms of discourse entirely. I think you ripped the central graphic completely out of its context without even bothering to try to explain what the other graphics on that page were doing, simply in order to shoehorn a favored interpretation (*). I am not serious, of course 🙂 In this hobby, all ideas are interesting to me, in particular when they are expressed with the support of images! In my opinion, the central detail might be related to the planets. I adhere to the common view that the outer circles representing the moon and divided in 12 sections could be related to the zodiac and / or the movement of astral bodies as a measure of time. 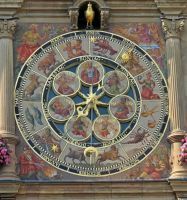 For instance, I find the Heilbronn astronomical clock a relevant parallel (even if it is much later than the manuscript: 1580). An eight pointed star at the center. The moon. 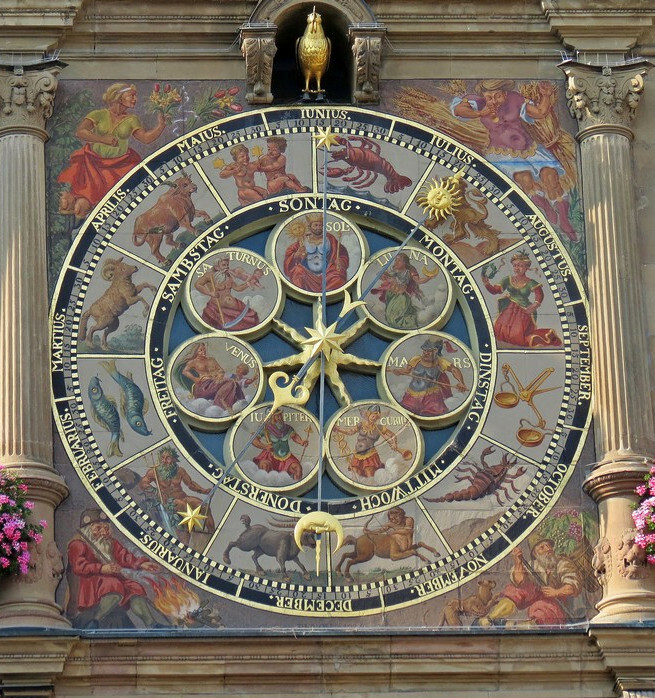 Two different sets of 12 circular segments (the zodiac and the months). Dear Claudette – where did you get the idea that “next to nothing in the Voynich manuscript definitively points to any classical, asian, semitic or otherwise familiar cultural construct”. There is a wealth of cultural allusion to non-European culture – including imagery resembling Suzani work, allusions to specifically Egyptian cultural attitudes, and even imagery of the lulav. I think you mean that to a person who flicks through the manuscript, nothing makes much sense, and what sense they try to make of it is usually pulled from what they are most familiar with, rather than from a systematic iconographic analysis. I completed my analysis of the imagery between 2008-10, but it has taken another five years to reduce it all to beginner’s level, produce images for comparison which I can publish copyright-free, and to reduce the historical and art-history background to the bare minimum wanted by most Voynicheros. Even so, many find it just too much hard work, hard-going, and ‘new learning’.. so much easier to slip back into the more comfortable context of Europe, even if it means talking about what is familiar, rather than what the imagery describes. D.N. – Let me get this straight. You’re seeing influences from 1) Central Asia, 2) Egypt, and 3) yet again, Judaism? And no one geographic location helps to rule out the others? Since you didn’t furnish a link to your studies, it’s impossible to tell how far you’ve gone with this, but I’m always willing to take look, especially if somebody’s suggesting I missed a lulav. That would be funny. It is worth reading in full, as it discusses a range of interesting issues, not least the ideas of Panofsky. I haven’t followed your recent discussion with this issue. Invoking the assumption of multiple plant species on folio 19r seems very far fetched for me, however. After all, all branches are connected to a single plant! Well, they seem to be connected to a single root, but in a rather odd way. Some people have suggested that some plants in the VM look as if they are spliced or grafted in some way. I agree but I lost my long explanation, so here’s the short version. I think the Voynich Memorial Gardens website has it right. See this pic, and those below it. 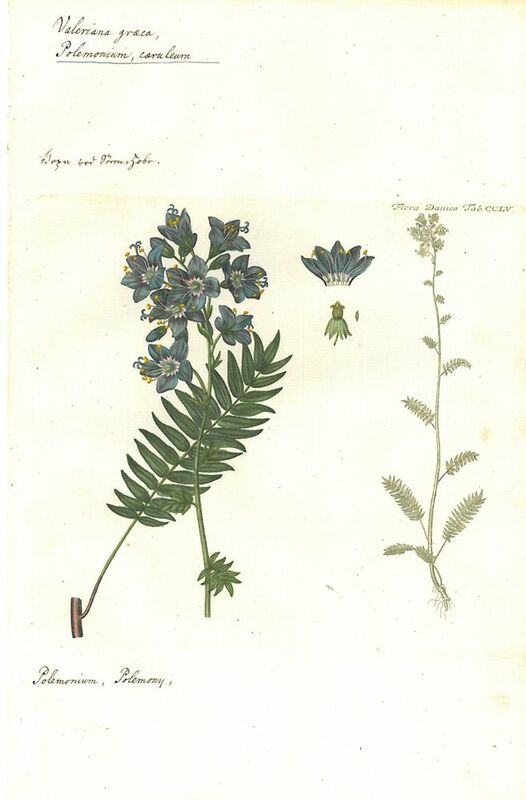 Blue flower, roots that resemble the diagram except for the vase section, fronds at the bottom and the upper immature leaves do not resemble fronds. So you can see how the resulting root of the transplanted piece would look like a bowl with new immature roots at the bottom, resembling those in the first photo link above. It was used historically as both medicine and as a dye. I attach another illustration of Greek Valerian. Yay it works. Just also wanted to mention that the stems come from the outside of the root, not the inside, which is why it looks like they are inside something hollow. If you look at some of the more immature root photos, you’ll see that new growth starts from around the upper edge of the root. The lack of stem doesn’t change this. And sorry for this being posted in a non-plant-related page but that seems to happen easily with the VMS. Now the original message is there too with the links. I don’t understand the mechanisms of the site I guess? I’ve waited before upon posting something that did not indicate it had posted, thinking it was a timing issue but nothing ever posted. This one never showed indication thereof even after I had posted the replacement, but has appeared now. Oh well. Sorry for the mess. I don’t always understand it myself! But you made it so well done! I have been poking around the internet (and thumbing through my old art history books) looking for ancient script that looks similar to this script. I stumbled upon an early Slavic script used exclusively in the Moravia region from the 9th – 12th centuries. I have posted a link to the “Glagolitic Alphabet” page and attached the cursive writing sample. I thought this could be helpful for some of the fancier script. From what I have read thus far, it is a combination of Greek, Persian, Coptic (and other) writing forms. 67r2 has anyone considered that the outside ring with all the little lines and circles maybe mathematical calculations? This maybe mapping lunar/solor cycles, I think it is called saros now although it is a very ancient practice, origins are Babylonian if I remember right. Something to think about if not already dealt with. That is an interesting question. I would have to go with solar more than lunar as the chart is missing two key lunar symbols that all other lunar charts have in common – that is a new moon and a full moon (neither are depicted). So lets say it is for solar calculations, would you read them going clockwise or counterclockwise? I thought about this a bit more and I think that lunar calculations could work if the double yellow moons represented a full moon, and the the double red represented a new moon; or ‘light’ and ‘dark’ moons as some would say. Or, two full moons within the same month, and two new moons within the same month. That would fit a lunar calendar I would think. Then one could throw out the application to yin/yang and just focus on lunar cycles. I think that if the DNA of the parchment was examined, one could tell genetic information about the cattle. Perhaps even isolate a region where they lived. I think that if the parchment is DNA tested, one might tell which region that the cattle came from. That could locate the place where it was written and give a general idea which language or dialect it was coded from. Indeed – and I am not sure why that was not done. However, it is perhaps not so easy to get very secure results about the origin of the animal, and in any case the skin could, I suppose, have been transported away from where the animal was killed. Generally extracting DNA from old manuscripts is possible (and done, I remember two working groups in Canadia and Austria doing it), with present techniques, however, you would require and therefore destroy quite a lot of material, I guess. After all this, you could see which, hitherto, sequenced animal is closest and may infer a rough origin of the material. You need a good reference database with samples from all the relevant areas from the relevant time to be sure, however. You could use contemporary samples, but then the provenance is not as easy to infer, because the further your reference is away (in space and time) the more divergent they are. Last, as Stephen pointed out, were the animal was held may be completely irrelevant to where the text was written. Teasdale, MD, van Doorn, NL, Fiddyment, S, Webb, CC, O’Connor, T, Hofreiter, M, Collins, MJ, Bradley, DG. 2014. Paging through history: parchment as a reservoir of ancient DNA for next generation sequencing. Philosophical Transactions of the Royal Society B: Biological Sciences 370: 20130379. They did need, however, 2x2cm². Species ID was pretty straightforward. The inferred provenance of their vellum fits with the known, but still the pitfalls I mentioned in my earlier post hold true. Fascinating, thanks. I suppose the Yale authorities don’t want to sacrifice even that much of the vellum 🙂 but in my view it would be worth it for the clues it could give us. This is the only page in the VM where red text is found. Its rarity suggests that its quite important. I’d be interested to know if anyone can provide specific historical examples of this kind of usage of red text in other manuscripts, as it could give a clue to some scribal tradition that’s being followed. I think you are right about the manuscript being a text book about nature and the stars but I would like to add that the manuscript is considerably more than that. Being an intelligent man, it must have already crossed your mind on more than one occasion that the reason why the manuscript is so difficult to decipher is due to the fact that it is not earthly in origin. This would also explain why none of the plants in the manuscript are recognizably earthly in origin either. It is not difficult to imagine in a system the size of the universe that there is an abundance of intelligent life throughout its expanse and that earth in its arrogance is only a very small part of that whole. The manuscript is in fact a book of lessons and examples describing various different plants, their DNA, and how their DNA is created based on a particular plant’s location in the universe. This is of course true of every living thing and not just plants, but plants are a good example and easily observable. Every plant and sentient living being has its own unique DNA, which is not only the blueprint for the being’s creation, but it also describes what the being is and where it is located in the universe. Different beings literally have different DNA depending on what they are and where they are located and their genetic DNA is dependent on a tunneling system of deciding factors that become the beings genetic “fingerprint”, for example: Someone from Earth would have their DNA determined by the galaxy they reside in, then the solar system, then the planet, then the gene pool (which type of being they are: human, mammal, fish, insectoid, reptilian, etc..) then their family lineage, then their origins (which country their genetic family originated in) then where and when they were born, their own present location in time/space, etc. etc. DNA is so intricate that it literally describes in detail our creation. If the same spiritual being were to incarnate in a different part of the universe they would have a different set of DNA. DNA is alive and changes as we do, to the extent that, if we translocate to another part of the world, if only for a brief period, we integrate that part of the world and the relationships we form become part of our own DNA structure. This is also true of languages and the very vowels, consonants, symbols and sounds that make our name are an accurate vibratory description of Who we are. The manuscript describes how we arrive at our current location in space time (although it is based on a different system from another location in the universe – the DNA principles are the same). It describes how plants derive their genetic makeup which is determined by a number of factors, like the genetic plant family and location in the universe, and how these entire “gene families” are influenced and created by the twelve signs of the zodiac, which are in turn based on constellations in the universe. I am not a biologist! I am an engineer and a psychologist. Which is probably why I am having trouble finding the correct scientific terminology to describe the clear picture I have in my mind of the what VM is, and the purpose of the VM and what it is describing. Basically, DNA contains all the information for who, what and where we are (all different ways of describing the same phenomenon from a different perspective) which is layered and encrypted many times before we come into being and are allowed to become embedded in the spiritual and material dimensions of the mind. Given this information and the simplistic way the VM is able to put into words what I cannot, I can only come to the conclusion that it is from a very intelligent source indeed… probably extra terrestrial in origin and far more advanced than our own. I also believe the VM has been left in our custody in order that we might decipher its mysteries and in so doing advance mankind along our journey of spiritual evolution. In any case I hope sharing this helps further your understanding and assists you in some way to decipher its meaning and you can be the first to share its message with the world, in a language that the world understands. Thanks – personally I feel that the VM is too clearly tied in with established cultural traditions, mostly European, to allow for any extra-terrestrial claims. There is a huge amount of the VM which clearly draws from earlier traditions – the illustrations, the herbal elements, the astronomy and more – and most of these traditions are European or near-European in origin. So to my mind it is not credible to argue for an extra-terrestrial, or for that matter any Chinese or Latin American or New World origins to the manuscript. I have argued that in some of the linguistic elements there seems to be an Arab-Persian substratum, and possibly in some of the plants too, but there are still a lot of basically European traditions which we can’t ignore. So although I think it is interesting to speculate as you are doing, I don’t feel that your basic suggestion fits with what we know so far about the manuscript – unless we want to weave in more and more speculation, which in my view is not productive. We’ve tried the speculation route (New Atlantis, Italian wanderers, Aztecs, Giant Lizards which live under the earth, witches’ covens) and I prefer now to try a more sober, step-by-step analytical route, slow and plodding though it will inevitably be. Thanks Saleh, I’d be interested to hear details of your ideas! why do you think its from Turkey, i cound’t find any similarity between Turkey and the book? No, sir, not from outer space. It was simply made by a bunch of blondes. The first time I saw page 67r2, I thought that the image in the centre could be a cross-section of a citron or some similar citrus fruit. I initially thought it might depict an etrog, which is a citrus used in the Jewish holiday of Sukkot. The etrog also has symbolic links to the Torah and to parts of the body. The ancestor of the citrus fruit we know today (lemons, oranges, tangerines, limes etc.) is the the citron (citrus medica) and it had medicinal uses in medieval times. The designation “medica” apparently is derived from its ancient name, “Median or Persian apple”, that was reported by Theophrastus,who believed it to be native to Persia or the land of the Medes. I think this lends further support to the idea that the VM is of Judeo-Christian origin. I think the 8-pointed star symbol may also have some meaning too. I think this could be a reference to the planet Venus. The Star of Venus also called the Star of Ishtar is an ancient symbol originating in Iraq used as early as 2000 BCE that represents the planet Venus, historically to represent the Assyrian and Babylonian Goddess Ishtar that are connected with Venus, as well as being historically used by Phoenician culture to represent Venus and the goddess Astarte (a counterpart of Ishtar). This symbol has retained its meaning through to modern times. It was depicted in the Iraqi national flag in during the period 1959-1963. The fact that these symbols appear on an “zodiacal” page in the VM, suggests that they have some associated astrological symbolism. I suggest that the citrus may symbolize the moon, and the star symbolizes Venus. I would suggest that these symbols also suggest a Persian/Babylonian link. Here I am. I am not an expert at all, so I could write a lot of nonsense, but I try to give you my help. In order to help the reading of the words I turned the page 67r upside down and zoomed into it. As you can see, I found out that there are two words (NKAR and similar) which could be “Nekkar” or similar (the star in the Boote constellation). For some reason the letter “e” is absent (Could it be absent in the whole Voynich?). What do you think about this? We can also see probably the word “saoar” (it reminds me of sahar, which means “dawn” in persian, and poetically used in hebrew referring to the crescent moon). Forgive my delay, but I haven’t entered the website for a long period. I tried to do what you suggested, but I found nothing. Have you discovered something? I mentioned the mirror because I noticed the writing looked very, very similar to that of the late Leonardo DaVinci. But..that could be pure coincidence, as the cursive writing style of the 1500s – late 1700s has a lot of the same looping in the writing. Maybe I could use that? Marco – its interesting that you’ve also identified Persian links on this page. When I started composing this response, I intended to only point out that that the word “SAoAR” also bears similarities with the Aramaic word for dawn. However when I googled on these terms (shr, aramaic), the top response had an intriguing “lunar” connection. I previously highlighted the possible lunar symbolism on this page in connection with the citron image in the centre of the diagram. The great moon-God of Harran, whose origin was not Aramaic, was certainly perceived by the Aramaeans and Assyrians as identical with the properly Aramaic lunar deity Sahr or Sehr (Shr), a name that should not be confused with Sihar, the “Dawn”. I therefore suggest that the word “SAoAR” actually refers to the Aramaic lunar deity Sahr. I should also point out that the Sabians, who I’ve identified as a possible origin of the VM, also originated from Harran. I agree with you. The connection with lunar deity Sahr is very interesting 🙂 Unfortunately I found anything new about it. Have you discovered anything? I have some ideas about page 67r, but I don’t know how to post images here (it would be useful for me to show you the figures). Can anyone help me, please? People often use http://www.pinterest.com and then just put a link to it! f69r the same 16 to 12 connection there are 16 outside division and then 12 divisions (between the “strong color blue and green light.) hour conversion, but i’m still puzzled with the 6 pointed star . the 45 (balls) and 22 “comments in the circle”. f67v1 first of all sorry for this inconvenience after all i couldnt find the plance to comment of this page… but i got inicially puzzled on the the division of the sun. (i sonnected sun to the day … and the divisions were 18… and then after a some research ive came across with the tradicional division of hours in the middle east / persian world as 18 so if the day was divided in to 18 hours, then this page could be simply a conversion between the 18 hours sistem and the 24 hours sistem. alo because the 5 “prayers” in the islamic world came from the division of the day in to 5 “groups” but during islamic times the day was counted in to 24 hours… this could be the sistem to identify the start that count the start of the day. that starts at 12pm. Is bit of a wild guess but is 24 18 conversion i think. I am attempting to translate a few of the letters/words and I have noticed that this text appears to be written backwards. I attempted to reproduce a few of the letters and the only way I could do so was to start at the end of a word. At first I thought the writer might be left-handed because of the trailing strokes (all of the letters will tails), but now I am not so sure. Also, my apologies for all of the typos in my previous post – that is what I get for using an iPad. How they are positioned on this chart is still a mystery, if we knew the century this manuscript was created I could probably run calculations to determine where in sky each of those planets were. I will continue to think on this. I believe the odd dotted line is how’s the rotational direction of earth.